three way laminate - green/white/black fixed in internal fin box. three way laminate - green/white/black. 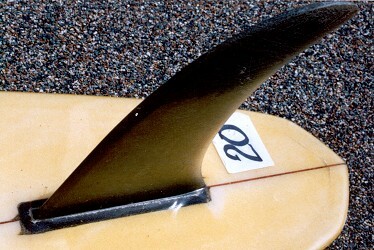 Board severely damaged (extensive dings, multiple stress factures) Butterbox, Long Reef 1972. 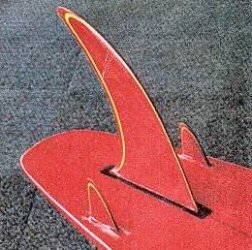 Mike Davis :Design Through Development in The Best of Tracks 1971 - factory photo, below. in Surfing World magazine Vol 16 # 1 1971? Template/fin images. 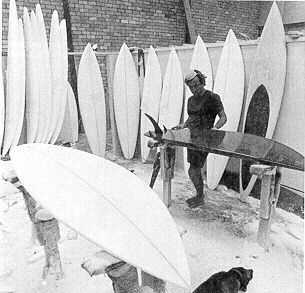 Barry Bennett Surfboards, 180 Harbord Road, Brookvale 1971. Re-published in Mike Davis :Design Through Development in The Best of Tracks 1973.